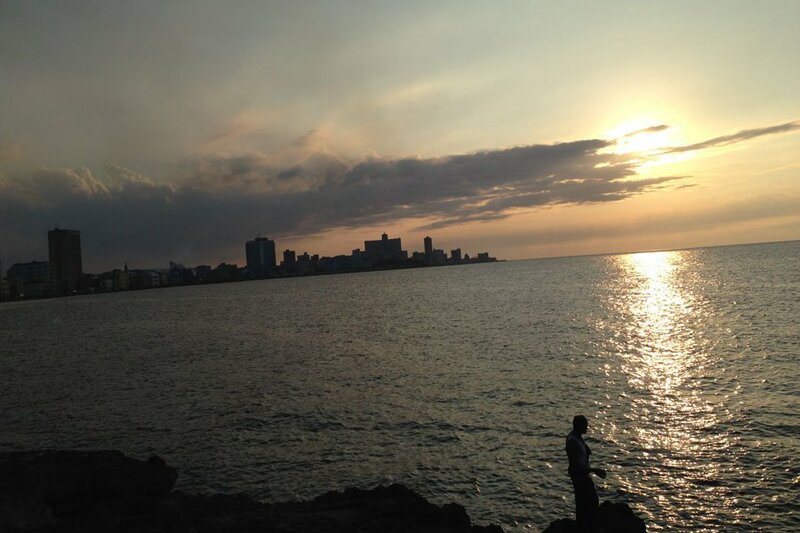 On the Malecon. Photo by Jeralyn Gerba. We were moved by this reader story from Maria Botta, a Cuban American who made her first journey back to the island nation just a few years ago. It was a deeply pivotal trip: an exile returning to the homeland she never knew. CUBA – Yo no soy ni de aqui, ni de alla. Loosely translated, I mean to say that I am not from here or there. I do not feel like a tourist or a native. When I landed in Cuba for the first time I had a major aha moment: I knew this place and these people. That's the thing about being a daughter of exile. My dream was to travel to the forbidden land of my forefathers, which includes many generations on my mother's side, and, on my father's side, a century-long history of Spanish and Italian immigrants who found success in the Santiago coffee business. Like so many, our entire family left everything in Cuba over 50 years ago. 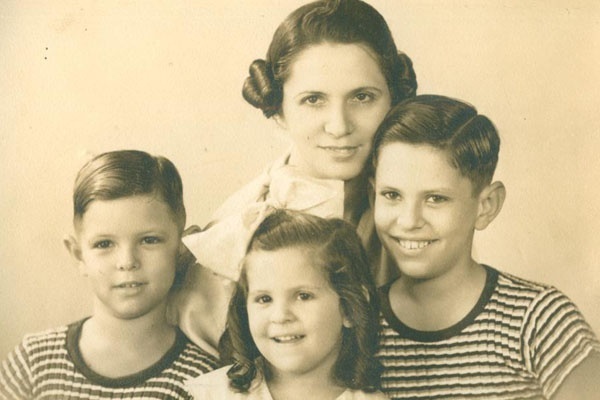 Never did they imagine that exile would last this long and that my grandparents and my father would not be laid to rest on their beloved Cuban soil. The author's grandmother, mother, and uncles. Photo courtesy of Maria Botta. Although I was born in the heartland of the U.S., in Missouri, I have always self-identified as a daughter of the Cuban Exile Experience, my life strongly influenced by my culture, first language, and traditions. I am academically and intellectually formed in America, but my soul will forever be Cuban. I want to know the land and reclaim my heritage, so I have been traveling to Cuba for the last two years as part of the People to People cultural exchanges. It wasn’t until I landed at José Martí International Airport for the very first time that I actually understood the weight of the journey. There is something very unique about the Cuban people that Communism has not been able to change, and that is the Cuban spirit — resolver. Nowhere in the world has a culture of resolver been more evident than in modern day Cuba, just look at the car culture that has prevailed, and how they have maintained vintage cars with nothing more than ingenuity, recycling, and creativity (the very essence of resolver)! The Paladares are another great example of this, although now some are as refined as any high-end restaurant you might find in any capital of the world. One of my favorites is Vistamar. Like all of the paladares in Cuba the food is hit or miss — but the ocean views are stunning. Although UNESCO and other organizations have put up a Herculean effort to restore the 3,000 buildings from the 1500’s that make up Old Havana, other parts of the city are literally crumbling. The disrepair comes from the ravages of time and the destructive force of a hurricane in 1981, but Havana is still a grand dame, a vast and dense city that is beautiful to me. It's a love poem to architecture through the ages. I love visiting the historic Cementerio de Cristóbal Colón (founded in 1871), 140 acres of gleaming white marble and exceptional mausoleums. Historians say it is the third most important cemetery in the world. Besides visiting my family's historic mauseoleum, there are two fascinating tombs: a 75-foot monument to the firefighters who lost their lives in the great fire of May 17, 1890, and two monuments to revered baseball players from the Cuban League. Sitting on any veranda or bar, having a delicious daiquiri (or two), I can imagine Hemingway hanging out telling stories to a bevy of finely dressed ladies and elegant gentlemen in their Irish linen guayaberas instead of the mostly (poorly dressed) tourists hanging around today. I recognize that many things have changed in Cuba since my family was exiled, and my mother's biggest lament has been that she was very sorry I would never know the brilliant, vibrant, first-world version of the country. But maybe, hopefully, I am in the midst of a change. 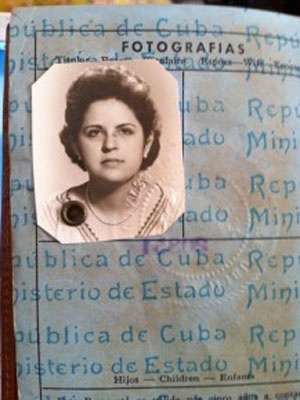 Additional photos (left): a passport photo of the author's mother; (right) the author under a double rainbow in Varadero. 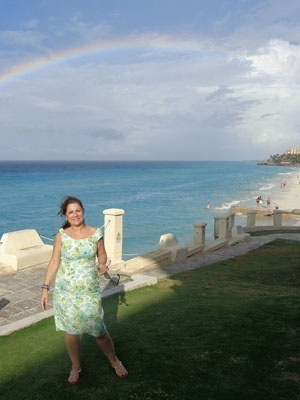 Maria is a digital and traditional media expert in Miami, Florida. She travels for the gypsy in her.